Almere is a new planned city in the Netherlands. It is in the province of Flevoland in the west of Holland. The local area around Almere was very rural and it was thought that the land should be used for agriculture, but after the war the need for new housing was thought to be more important, especially as the area in and around Amsterdam had lost so much housing due to bombing and war damage. Almere has a very short but explosive history. From being nothing but fields and farmland in the early 1970’s Almere has quickly grown and expanded into to the 7th largest city in the Netherlands, and the fastest growing city in Europe. After the Second World War There had been much devastation of the housing stock in Holland, both due to the Allied and German bombing and the damage inflicted as the Germans were driven out of the country and the Netherlands was liberated. In Amsterdam much of the populous had been displaced and much of the traditional housing stock had been destroyed. With the return of the cities inhabitants came many more, who seeing no future for employment and betterment in the small towns and rural areas that had been liberated, saw their future in the capital and its surrounding areas. So a great deal of housing was needed very quickly and plans were drawn up in the years that followed for many new urban areas. And also the new town of Almere to pick up the people who were trying to find housing in nearby Amsterdam. 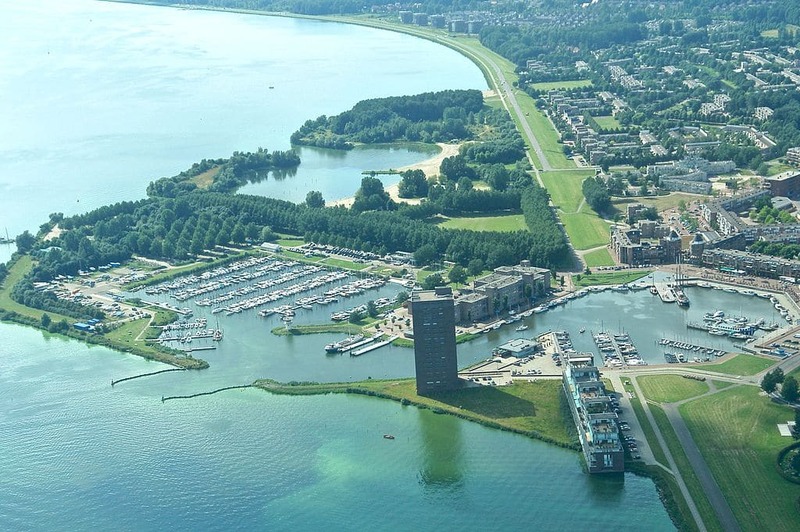 Since the completion of its first buildings in the mid 1970’s, Almere has grown at an exponential rate right up to its present day population of, just under 200,000. If you are flying into Almere then you will arrive at Amsterdam Schipol Airport. Schipol Airport is well connected for arrivals from Europe and the rest of the world and is one of Europes busiest airports. The easiest way to travel to Almere from Schipol Airport is by train. There is a train station at the airport so you do not have to go into central Amsterdam. The journey is quite quick as it is only about 40km to Almere from the airport. Train travel is usually the best option if you are travelling from inside the Netherlands as there are good connection from throughout the country. you can get direct trains from Utreche, hilversum, DenHaag, Vlissingum, Roosendaal, Rotterdam, Amsterdam, Leeuwarden, Dronten, Droningen and many other areas. You can also take connecting trains from virtually anywhere in the country. If you are travelling by car then you will need to take the A1 from Amsterdam and then change to the A6 to Almere. If you are travelling from Hilversum, or Utrecht then you will need to take the A27 and then change to the A6. There are also, long distance buses from, From Amsterdam, Utrecht, Hilversum and Naardum and Bussum. Some of the buses go to Almere Centrum, but for those that do not you can always get a connection into the centre of town. The bus service around the city is usually very good. The best way to pay on board the bus is to buy an ov-chipcaart. This is a small credit card sized card that you re able to load up with funds for your journey. As always in the Netherlands, bicycles are a good way to get around town with many dedicated cycle paths making it much easier. You can hire bicycles from the central station and from bike shops. There are also plenty of taxis in the city and you can find them at taxi ranks outside most stations, or you can call them to get picked up. Taxi 001, +31 800 4444001, Finish Taxi, +31 36 5303400. The Museum De Paviljoens. was moved to Almere in 1994 from its previous home at Kassel. It is a great space, that has shown many new and contemporary artists over the years, with many artists making a direct connection between the modern design of the building and their own work. If you are interested in the modern architecture of Almere, the best place to go is the CASLa. They will be able to give you a great deal of information about the cities modern architecture and can supply you with guides and maps that show you what to see and where to go. Much of the best new buildings are in the centre of the city and a walk down by the water will reward you with such gems as The Wave, The City, De kunstilinie, which plays host to the local theatre and another residential building called Side By Side. The Stadshart is the main shopping centre of Almere. It Is a huge place with plenty of parking in the centre of town and has won many awards for its modern design. The Stadshart has over 400 shops in it and you should be able to find anything you want there. There are many other shops and little shopping centres around the city, but the Stadshart is definitely the biggest and best. The Boathouse by the Noorderplassen is a warm and welcoming restaurant where, according to the time of day, you can get anything from a sandwich to a very fine meal. It has great atmosphere and the staff are knowledgeable and friendly. The Brasserie Bakboord is also situated by the water, in the harbour basin and it has some wonderful terraces for sitting and eating and as well as doing simple lunches, you can also get a very fine meal there as well. If you are interested in modern Architecture then Almere can make for a very interesting visit for a day or two and your curiosity will be well rewarded.